WOW! 45,00 bottles - Where are they all hiding? World's Relief with curved "R's" I can't seem to find any advertisements for Ol' Doc McBride's "Relief" anyone have anything on this product? Embossing on the "fire aqua" King of Pain with straight leg "R's"
The "King of Pain" could cure anything lickety-split! Ads appear in both S.F. 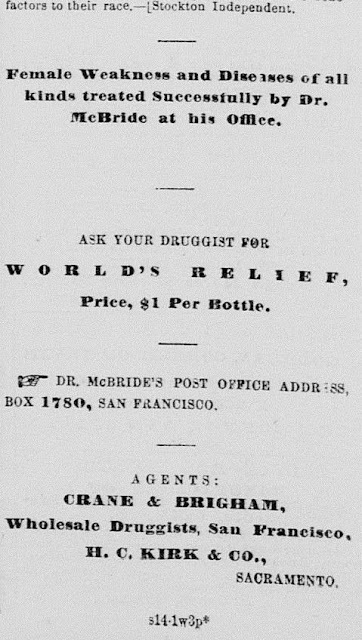 and Sacramento papers during a short time frame in the year 1875 for McBride' s World's Relief product. What great names for a medicine! I have seen the King of Pain in beautiful light to dark green and everything in between. The product must have been fairly popular. As for the World's relief, I have never seen one in color. They must have made much fewer batches as they seem to only come in a lighter blue aqua.Maybe just quality control as to glass color. I dug one a couple of years ago which is very heavily whittled but still the same lighter color. 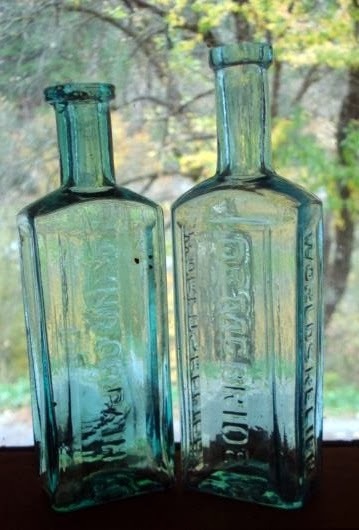 Dale M.
The marketing of McBride' s King of Pain product starts in 1869 and runs through 1875. Dr. McBride died of consumption in early 1879. Guess he should have created a consumption cure? Guess I did not know the KOP was sold that late. Do the later examples have the blocky square collar top like the World's Relief? Seems like the KOP was sold for over 10 years? I know the Pratt's Abolition Oil, and Dr. Murray's Magic Oil were as well. I have dug tooled Pratt's in late 60s pits, and applied Pratt's in 80s holes. The Murray's come applied and tooled in amethyst glass from the mid to later 80s. I have an applied Murray's dug in a late 60s early 70s hole in Nevada next to one of the Giant Langley's Sarsaparilla's. 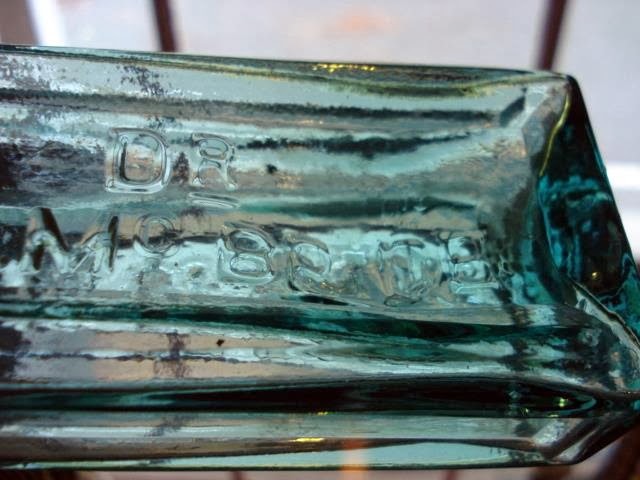 Dale M.
the langleys sarsaparilla I dug that was light cornflower blue was in a new well that had a cobalt largest size owl three sided drug bottle in it.